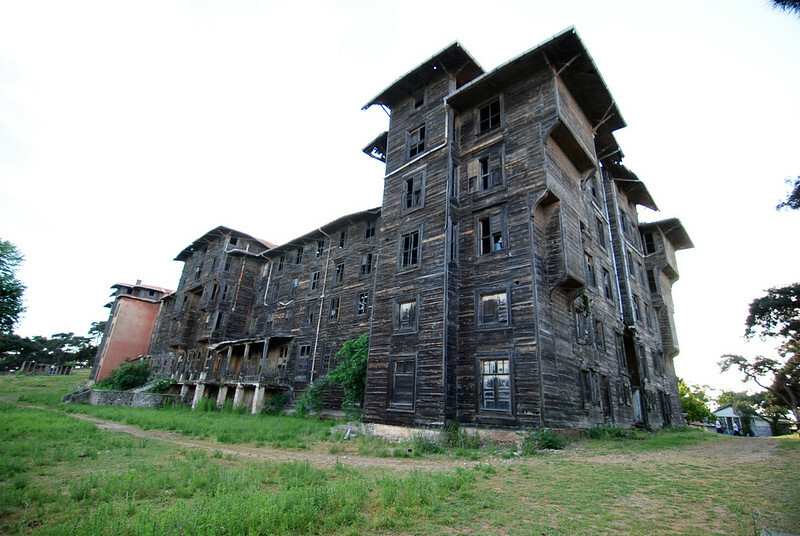 The Prinkipo Greek Orphanage is considered to be the largest wooden building in Europe and the second largest in the world. The impressive structure is located on Büyükada (Prinkipo), the largest of the Princes’ Islands off the coast of Istanbul. Spread across five storeys, the building is comprised of 206 rooms. The timber framed structure features elaborately decorated wooden columns in the grand hall and panelled ceilings with decorative mouldings. In addition there is a three-storey secondary school, also built in timber on the site. The building was designed by the French architect Alexandre Vallaury, to be operated as a luxury hotel and casino from the time it was built in 1899. In the early 1900s the Princes’ Islands had become a favourable summer resort for communities of Istanbul from different religious and ethnic origins, creating a microcosm reflecting the cosmopolitan character of the city. The building is important as it captures something of this era and the society in which it was built. In 1903, since Sultan Abdul Hamid II did not issue a permit for its operation, the Orphanage was bought by the wife of a prominent Greek banker, who then donated it to the Ecumenical Patriarchate of Constantinople under the condition that it would function as an orphanage. It was used as such until its closure in 1964. Since then, the neglected building has deteriorated and presents a picture of advanced disrepair. Disputes regarding the ownership and intended use of the site which continually presented challenges to the general upkeep and conservation of the site and detracted from any efforts to advance its cause, have however now been finally settled allowing conservation to proceed. Damaged by a fire in 1980, today the building is continually exposed to adverse weather conditions which is worsened by its proximity to the sea. As a result, the structural elements have been badly compromised. Sections of the roof and corner posts have already fallen and the Orphanage is now at immediate risk of further collapse. Concerns about safety and accessibility complicate the already difficult task of finding a suitable reuse for the building. Europa Nostra Turkey, who submitted the nomination for the 7 Most Endangered programme 2018, has proposed that immediate repair and maintenance of the site is needed and that the first action should be to start a campaign bringing together the means and efforts of interested parties for this purpose. The possible prospect of setting up of a Centre of Environmental and Interreligious Dialogue in the building, as conceived by the Patriarchate, could figure as the most appropriate future use of the Orphanage but there needs also to be a plan for its sustainable maintenance in the years ahead. As long as the site goes unused and uninhabited, the buildings remain unmaintained, thus accelerating the rate of deterioration. A total loss of the structures is assured if urgent action to support and protect this iconic building from the effects of weather is not put into almost immediate effect.